Last night we had a very special visitor, Aunt Liza! The Wombats are always excited when we have guests. We are also excited because any tiny bit of additional help makes it feel like we're on vacation for the night. While they still reeled from the time change we let them convert half of our table into a play area and watched as they rubbed their eyes and tried to fool themselves into thinking that they weren't actually ready for bed. 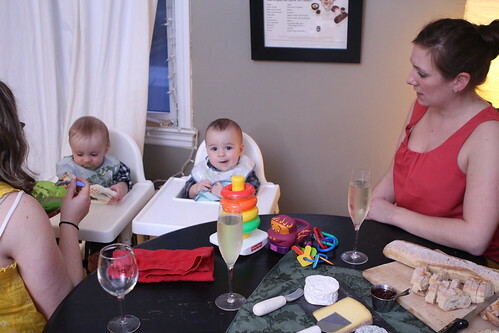 What better match for playing with babies than a Vermont cheese plate? 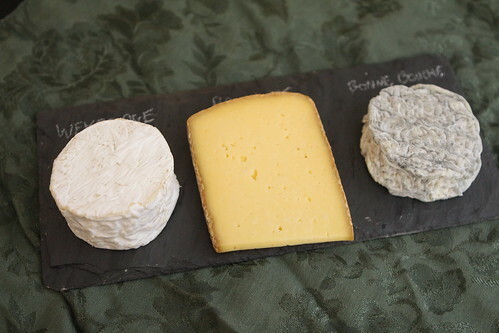 From left to right: Weybridge from Scholten Family Farm, Pawlet from Consider Bardwell Farm, and Bonne Bouche from Vermont Butter & Cheese Creamery. 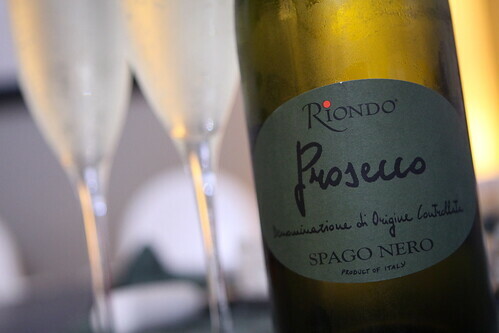 To celebrate the arrival of our out of town guest we cracked open this bottle of Prosecco. Jen celebrates any time anyone comes over by drinking sparkling wines since she loves them so dearly and, sadly, I am not always eager to share them. It' snot that I dislike sparkling wines it's just that I'd rather be drinking beer. Like this tasty La British from La microbrasserie À la Fût. 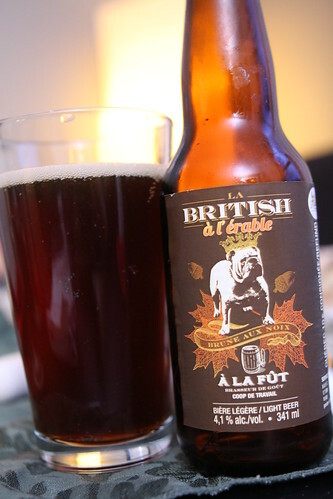 This was another very tasty British-style brown ale from our recent trip to Quebec. It's surprising because I would have thought that Quebec would have done a better job with their Belgian-style ales given their attachment to that beer culture. I'm finding that their British entries tend to be a bit nicer so far. It is early still in the selection. I'll be able to form a better opinion in another twenty or thirty beers. For dinner I made them chicken with kale, multigrain cereal, and milk. Elliott liked it okay. Martin, on the other hand, seemed to hate it. 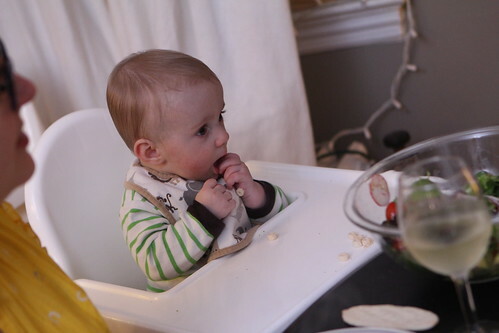 He does this from time to time so I'm hesitant to trust any of his initial reactions to foods. Sometimes he gets a little over dramatic and acts as though we are poisoning him. He likes chicken. 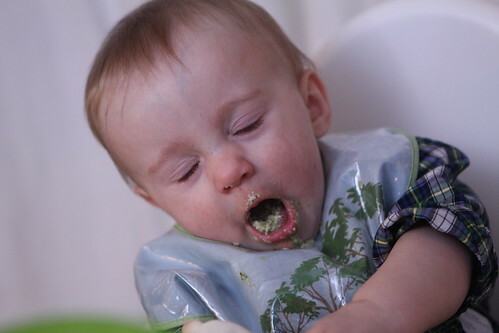 He likes kale. He likes multigrain cereal. He certainly likes milk. 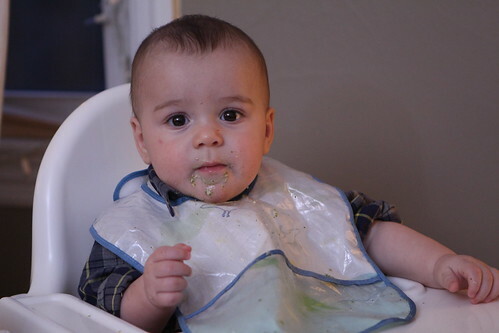 Come to think of it, Elliott may not have been in love with his dinner either. I think he's just too polite to make his feelings known. Martin is a little more direct. 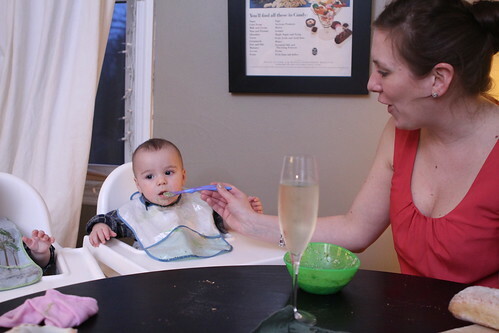 After Jen made some sweet potato and apple and Martin suddenly regained his appetite. 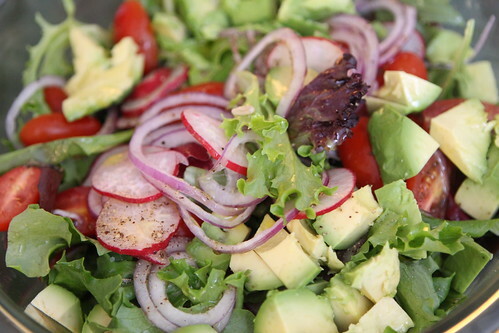 After getting the guys to sleep I put out this salad with avocado, radish, red onion, grape tomato, Lisbon lemon juice, olive oil, salt, and pepper. 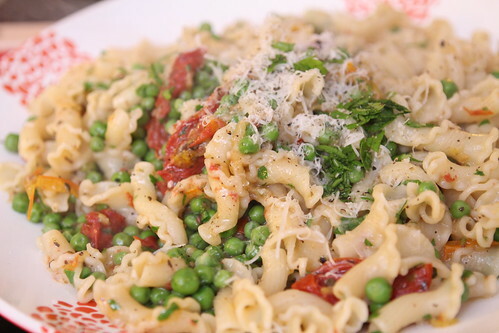 I also made toscani with fresh peas, roasted red and yellow tomatoes, chopped parsley, and a little Parmigiano-Reggiano. 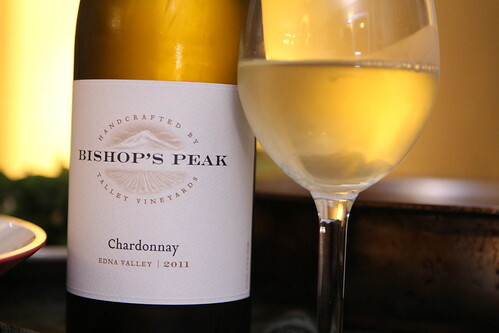 For the ladies I poured this 2011 Bishop's Peak Chardonnay from Talley Vineyards in Arroyo Grande, California. Again, I like wine but it tends to take valuable drinking attention away from beer. Also, I find Chardonnay to be not that great. Sorry, Chardonnay lovers. It's just who I am. 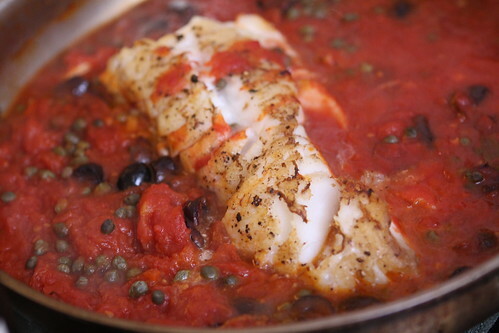 For the main course I got a beautiful piece of cod which I roasted in the pan with crushed plum tomatoes, garlic, olive oil, capers, and kalamata olives. 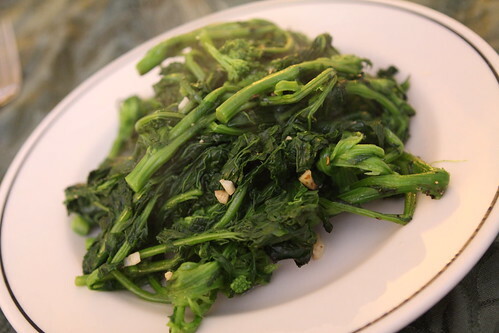 I served it with broccoli rabe, olive oil, and garlic. 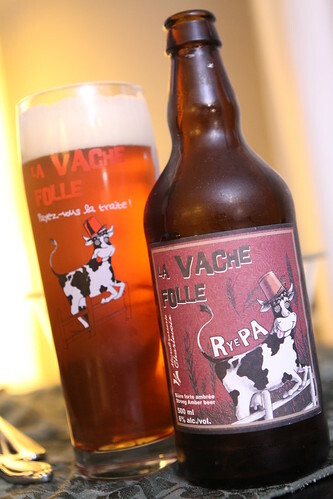 For my "Chardonnay" I had this La Vache Folle RyePA from Microbrasserie Charlevoix, another Quebec treasure. This was a really nice beer with a nice grapefruit hoppiness and great maltiness. The downside of having a really good beer like this is knowing that I probably won't get another one for a good long while. That is part of the perils of spending way too much money on beer from a faraway land. After many unsuccessful attempts Martin refused to believe that he was actually tired and finally joined us at the table for some adult conversation. He just cannot stand it when there are things going on and he has to go to bed. The little guy doesn't want to miss anything. Besides, he had some fascinating insight on our political discussion. Who knew the little guy was so well read? Good Sleep, Bad Sleep, and Paella!